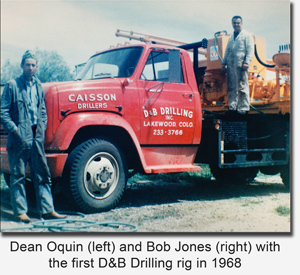 D&B Drilling, Inc. was incorporated on May 1st 1968. D&B was started by next door neighbors living in Lakewood, Colorado. Dean Oquin, a tall gangly cowboy working as a caisson driller for Elco Drilling and Bob Jones, with an education in mechanical engineering, working as an airplane mechanic for United Airlines. Dean & Bob decided to start a foundation caisson drilling company. They started with one rig, a Texoma model 270 mounted on the back of a 68 GMC truck with hand painted lettering on the doors. Dean and Bob operated D&B Drilling for several months when during a job drilling holes for road side guard rail they hit an overhead power line with the drill rig derrick and caused a power outage in the town of Evergreen. Whether it was that experience that helped Dean make up his mind, nobody knows, but after that Dean decided being in business for himself was not for him, so they agreed that Bob would buy Deans share. Bob first kept the drill rigs parked behind his home on Dover Street in Lakewood, often lighting up the night sky welding on augers and performing maintenance and repairs of the drilling equipment. Bob quickly outgrew the area behind his home so he moved his equipment yard to other commercial locations until in the early 80s he ended up at an industrial site near the Coors Brewery in Golden, Colorado where D&B's equipment yard, maintenance shop, fabrication shop & material inventory are still located today. In the 80s and 90s, D&B became one of the largest caisson drilling company's in Denver, operating more than a dozen drill rigs. Bob was always looking for ways to improve by adding larger equipment and at the same time, building portable drilling equipment to meet customers’ limited access drilling needs. It was his pursuit of innovative improvements that led Bob to Helical Piers. D&B started installing A.B. Chance Helical Piers in 1987. Bob became the A.B. Chance company’s largest distributor, while at the same time D&B became the worlds largest Helical Pier installing contractor. D&B Drilling drilled it’s last caisson in August of 1998, focusing entirely on Installation of Helical Piles and Tie Backs. With Professional Engineers on staff to assist the engineering community in its design and use of Helical Piles, D&B Drilling became D&B Engineering Contractors. 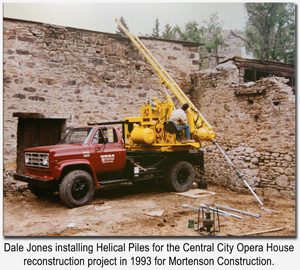 Bob Jones, the inventor and manufacturer of Heli-Pile® products currently holds 6 U.S. Patents, with others pending. Bob, at 73, is still involved in the daily business. D&B would not be where it is today without the contributions from Bobs' wife and business partner, Elaine Jones. Elaine has worked countless hours throughout the years, taking care of accounting, human resources and other constantly growing administrative duties. Elaine served as President of D&B from 1994 until 2005. It's only been in recent years that others have been hired to help with the overwhelming accounting and administrative responsibilities. Dale Jones, Bobs' youngest son, currently serves as President of D&B Engineering Contractors. Dale was four years old when Bob started D&B, so he grew up around the business. Dale has worked here for over 25 years, starting out as a laborer in 1985, working his way up to Company President in 2005. According to Dale, "no single person is responsible for the success of this company, our success is the result of team work. 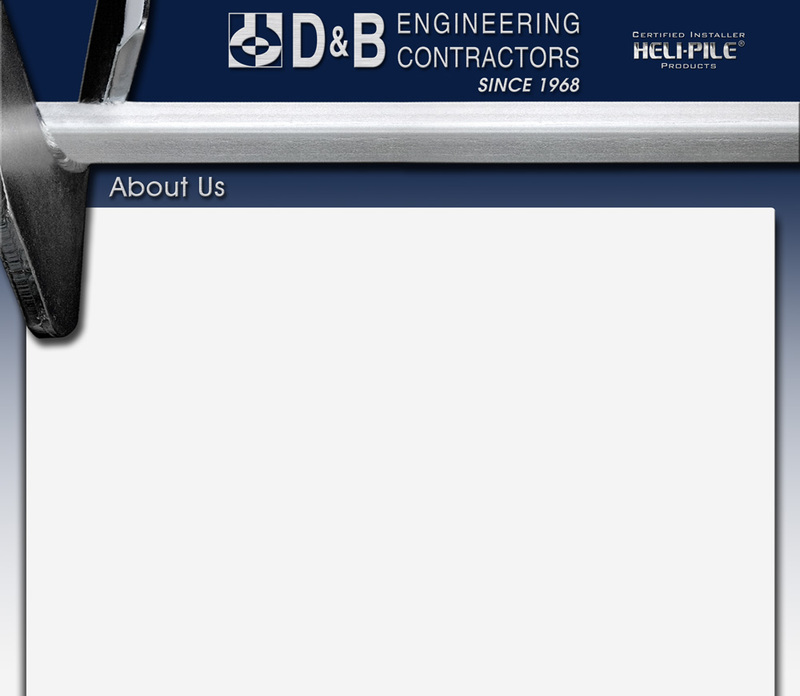 D&B is a team of hard working individuals, all doing their part. Everyone here is a key employee and we enjoy working together, we take pride in what we do. Our goal is to keep living up to the reputation that we've worked so hard to build, by continuing to lead the industry with unsurpassed customer service and quality work that we can be proud of."